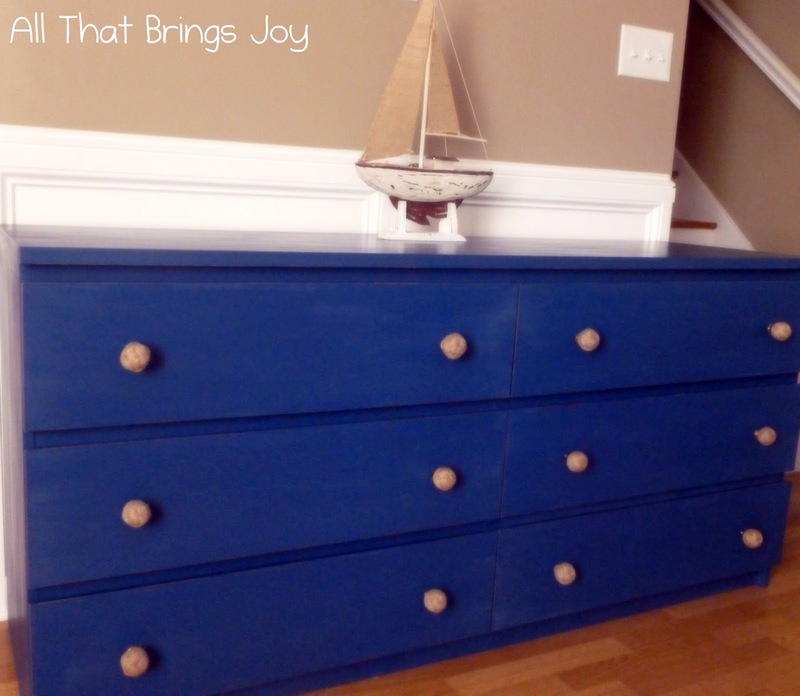 A client brought me an Ikea 6 drawer Malm dresser a few weeks ago looking to turn it into a piece of furniture with a nautical feeling that had a little more character for her boys' room. 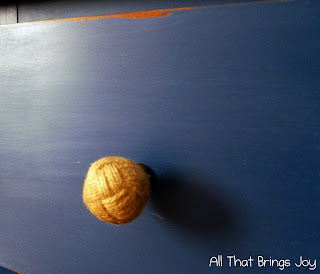 We decided to go with the color Napoleonic Blue by Annie Sloan and add some rope knot pulls from Hobby Lobby. So what do you think? As you can see from the before pic this was a laminate dresser with no knobs or pulls, very plain and boring! I started by making a template of one of the drawers with my kids craft paper. I marked where I wanted to drill the holes for the knobs and then taped the template onto the front of each drawer, one at a time. I marked a few measurements on the template, as you can see, but I ended up using 5 1/2 inches from each end. I'm not going to sugar coat it, painting this beast was a pain! ;) My husband came up with the perfect analogy, it was like washing a black car. Just when you think you've covered every spot you look at it from a different angle or in a different light and see a bunch of spots that you missed! I think I painted it about 4 times. It ended up distressing just fine. The paint pretty much just peeled off in some places when I ran the sandpaper over it with a bit of pressure. Then I waxed the whole thing with clear wax. When I work on pieces for clients I get a little nervous. I want so badly to give them exactly what they're hoping for and then some! So I just have to say a huge thank you to my client, Amanda. She was my first real client and even came back with more work, she's recommended me to her friends and been nothing but delightful to work with. She's always cheered me on and encouraged me to go one step further with my new business. She's been such a blessing to me and I will be forever grateful to her!! Very pretty. I love the drawer pulls. Congrats on your first client - you're sure to have many more with results like this! Love the color and the knobs - perfect! New Linky follower. I love how the dresser turned out, that blue is so beautiful! Congratulations on your first real client - that is super exciting! I'm just getting started myself, so I can imagine how thrilling that must be. You did a great job, so I'm not surprised that she has more work for you. I'm your newest follower! 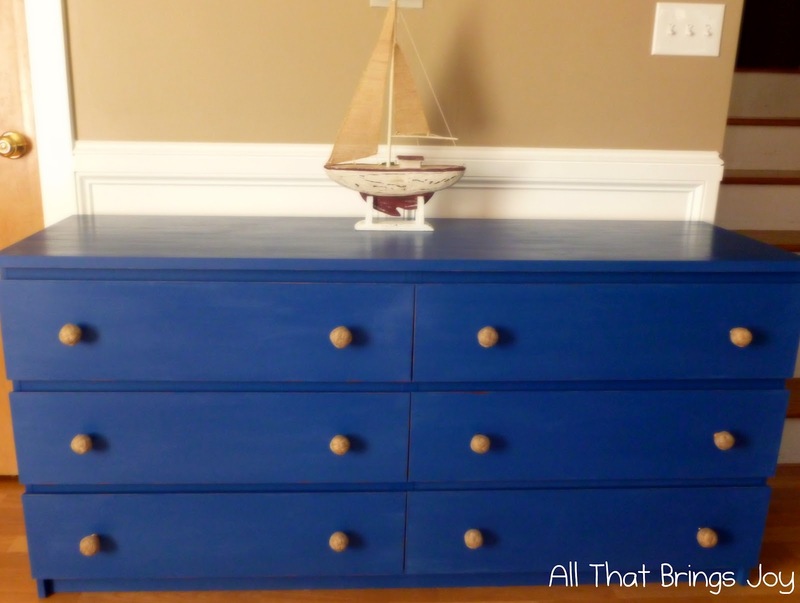 The dresser looks great in blue and the knobs add the nautical touch. Awesome job. I love the color you chose. What a great transformation! I love the choices you made.